At a press conference on Wednesday afternoon, North Dakota Governor Jack Dalrymple said the North Dakota law enforcement is not going to stop people from providing supplies. Gov. Jack Dalrymple conceded his evacuation order issued on Monday has resulted in a lot of confusion. During a press conference held at 1 p.m. today, he clarified the intent of the action. "There was a misunderstanding on how we are going to use this executive order," said Dalrymple of his order mandating evacuation of a protest camp in southern Morton County. "We are not going to be stopping people." Nor will anyone will be blocked from providing supplies such as food, water and clothing to those in the camp. "It would be a huge mistake from a humanitarian viewpoint," said Dalrymple, stressing that the state also has never discussed forcibly removing anyone from the U.S. Army Corps of Engineers' land. Dalrymple said the executive order serves as a warning to let people know the camp is not placed safely and will be subject to flooding as ice jams on the Missouri River. "It is official notice from the state, the National Guard and law enforcement that we may not be able to reach you," he said. "If an emergency developed, there are serious concerns about our ability to get there." Gov. 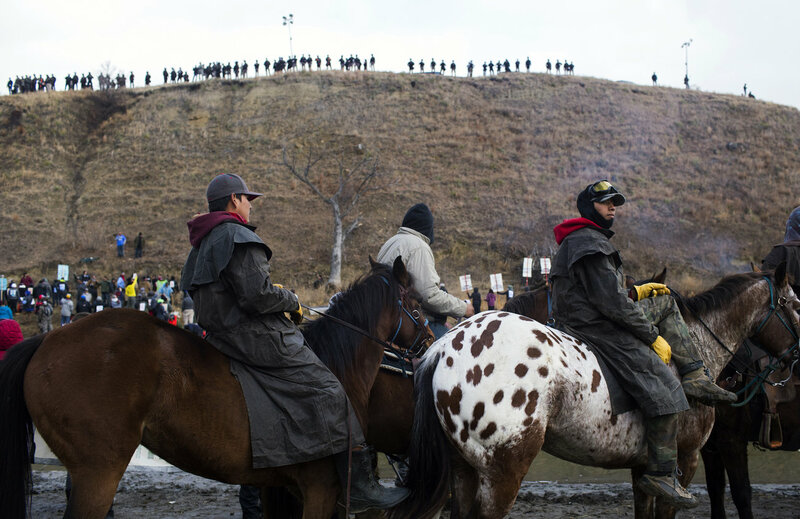 Jack Dalrymple wants to meet with the Standing Rock Sioux Tribal Council in the coming days to discuss the Dakota Access Pipeline protest and begin rebuilding state and tribal relations. "In my opinion, we need to begin now to talk about how we are going to eventually arrive at a peaceful resolution of the situation and restore the relationship between North Dakota and the Standing Rock people," Dalrymple said during a news conference Wednesday, Nov. 30. Responses to "North Dakota Governor: We Will Not Block People Taking in Supplies to Camps"
If the government destroys all the land and water, what are we to do? I pray that you are sincere Gov.Jack Dalrymple and remove the blockade so the protectors have better access to much needed services,support and supplies. thank you for choosing to honor life, by not furtherly endangering it. please reconsider you support of this death dealing pipeline as well.